December was a good month. Not quite as good as November, but I'm still satisfied with the level that I made – especially since I spent a good amount of time away from my laptop. It's now January though, which means that I have a brand new month and year to start over. I'm ready for my first full YEAR of self-employment. In December of 2013, I made $12,860 in business income, before expenses. I'm hoping for a higher level in January though, but it has been a slow start so far because of the holidays. Lately, it does seem like I am at a little bit of a standstill. I do need to try working harder. I am not going to lie – I have probably been taking off more time than I should. I will blame this on being so busy the past few years and my laziness is just trying to catch up to me. Also, we did sell our suuuper nice 1961 Chevy Apache in December, but that amount is not included in this income post as it is not a part of my business income. We did get to put a pretty penny away and we made a profit on the truck, so that was nice. I didn't think my level of income was attainable. 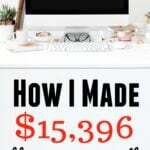 Just last December, I made $5,770 in extra income. $5,770 is, of course, still a great amount, but each month I am still amazed by my progress. Like I say every month, when I first started blogging, I didn't think this level of income was possible. 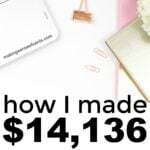 I read (and still read) income reports from bloggers such as Pat at Smart Passive Income and Crystal at Budgeting in the Fun Stuff and I thought their levels were just completely unattainable for me. I'm sure many of you feel the same about your level of “extra income” and that my story is just a lucky story. However, I read stories on other blogs and used them as motivation for myself. I didn't think their levels were possible for me, but it turns out that I was wrong. And, I'm glad I was wrong. No, I'm not at the levels of Pat or Crystal, but I will keep trying everyday to improve my business. This is for the month of December and before fees and expenses (expenses that lower the amount above include approximately $700, which includes VAs for my other websites, PayPal fees, etc.) being taken out. December‘s number above includes a rent payment from my sister and her boyfriend. So after all expenses and fees, I made approximately $12,160. In the amount above, I do not count the amount that I bring in to blogs that I help run, I only include the amounts that are my actual earnings from my services. This is still a job! This is not passive income, although one day I hope that much of my income is passive. I have also been growing this for quite some time, and for around one year I was not making a single dollar, but I was still putting full-time hours into my side jobs. Taxes also take approximately 30% of my extra income. This is something that not everyone thinks about. I plan on creating a post about taxes as a self-employed person on Diversified Finances soon. Oh yeah, and many of you have been wondering every month – I do have an LLC for my business. I worked as a business valuation analyst for many years, so I do know quite a bit about businesses and how to set them up (and operate them efficiently/effectively). As I say every month in my income update posts as a reality check: this is still work. Some like to think that I quit my job and I do nothing, but I really do a decent amount of work. It does help that I have gotten much better at streamlining tasks and hiring others for certain jobs that I need done. Luckily, I do enjoy what I'm doing so it's not like I'm dreading anything. The goals that we have are also a great motivator. You can find my 2014 goals update here. All of my past income updates can be found here as well. Read further on my Extra/Business Income page. I don't believe that there is too much going on at Making Sense of Cents. I'm still chugging along. I do find myself talking about lifestyle design more (such as with my post – Do you make excuses for why you're not following your dream?). Does everyone enjoy these lifestyle design articles? I have fun talking about the subject and writing about it, which makes it easy for me! My sister's blog is still doing well. I'm hoping to get her more involved with her blog and start promoting her blog more. Please subscribe to FITnancials if you haven't yet. My self-employment/financial independence blog Diversified Finances is doing well also and I am so glad that I started this website. Being able to talk so much about self-employment and getting direct feedback from readers is great. Is there anything related to self-employment that you would like me to talk about? Please let a comment below if so. What about my progress after FinCon 2013? One question that I am asked a lot is what I learned from FinCon that I am trying to apply to my business. I learned many things at FinCon and I made a list of things that I need to do in my post My Plan For the Future. I really have not been that active in making improvements. I need to change that and I need to start making an action plan. Start an eBook. – I still have not even thought about this. However, I will say that starting an eBook is not at the top of my list right now. Maybe later, but not right now. Build my brand. – I have not done much to build my brand. I guess I am still unsure as to what I should do in order to build it. Promote more. – I do think that I have been doing better with focusing on promoting my blog and the articles that I write more. Accept more interviews. – I believe I did two more interviews in December. If anyone wants to interview me, I am free! Speak at a conference one day. – Speaking at a conference is definitely not in store for 2014. Maybe 2015? I don't believe I added any new staff writing gigs in December, but I also didn't actively look for any. I am still looking for a few more staff writing gigs. I have found that I have plenty of free time and I'm just not productive unless I have something filling in those time slots. I also love writing and have over 100 ideas in my phone for new potential topics! I created an article titled So You Want to Be a Freelance Writer?, so please read further about this topic if you are interested in staff writing as well. I bought my very first website in November of 2013, but I haven't done too much with it yet. I do have articles on there and I have a virtual assistant helping me with some work on it though. I do still believe that I received a good deal on it. I'm hoping to continually increase the statistics on the website and hopefully increase the amount of readers as well. Do you have any questions about buying a website? Or, have you bought a website? I plan on covering this more soon. One area that I am doing better in is blog and social media management. Lately, I have been seeing that many blog owners are interested in having me manage their blog while they are on vacation or if they need a break. This is something that I love to do, and you can sleep easily while you are on vacation because I believe I can successful manage your website. I also know how it feels to go on vacation. You might be hesitant in hiring help because your blog means so much to you. However, that is why I love offering this service. I truly know how much a blog means to a person, and I try my hardest to make the transition (no matter how short) a smooth one. A vacation from your blog might be needed – and I'm here to help! 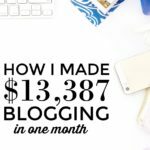 I manage different aspects of several different blogs, and that is what has helped me ramp up my business income in the past few months. All of my services are a lot of fun, as I really enjoy blogging and social media, and all other areas of managing a website. Watch to make sure that your website does not go down. Monitor e-mails and reply when/if necessary. Reply to comments on posts. Make sure postings go live when they should. Write articles while you are away (including ghost-written articles). If you need a blog or social media manager, please let me know. I can manage your blog for a short period of time as well. If you just need one week, one month, or some other time period off from your blog (such as for travel, to unplug, a vacation from your website, to start a family, to start a new job and so on), I can help with this. E-mail me with any questions. Affiliate income – Still no changes. I have been doing horrible with affiliate income. And, I feel horrible about that because many of you have been asking me to review your product. I keep blaming it on time, but that has to come to a stop. For January, one of my business goals is to finally go through the affiliate offers that I have. I then want to start making an action plan and schedule to go through them, and see which ones are worthwhile for me to review on my website. What type of reviews would you like to see on Making Sense of Cents? I have been thinking about starting to review credit cards as we want to start using them more. I haven't really put any thought into creating an offline side hustle lately. I still have my ideas, but those may be put on hold for right now while I work on growing my online business further. What offline side hustles do you have? How did you do in December? What are your extra/business income goals? Every single month!! Amazing stuff – well done. A true inspiration. I would love to read more about the website you bought – what you are doing with it, what needs doing, how are you changing it, NPV analysis on purchasing, etc etc. Congrats on getting $10k+ again in December. If you could start bringing in more money from affiliate advertising you may be able to add a few more k onto that total each month. I’m really trying to focus on that this year, though I know it sometimes can be hard to implement. I am starting to reconsider whether or not to pursue a spreadsheet consulting side hustle. I think I could bring in quite a bit per hour if I do it right. At the same time I could also just create some spreadsheet templates on my blog and that would drive traffic and $…so many possibilities, so little time! Thank you DC! Yes, I need to start focusing on affiliate income so that I can start making my writing work for me. I’m focusing on affiliate income too. It’s definitely more of a long term strategy since it doesn’t pay as quickly as writing posts does, but it’s a killer way to earn money long term from what I’ve seen from the big guys. Thanks! I don’t know a ton about buying websites – and I will honestly say that. I bought it at a super low price. I plan on changing it by pumping tons of articles into it in order to increase its stats. 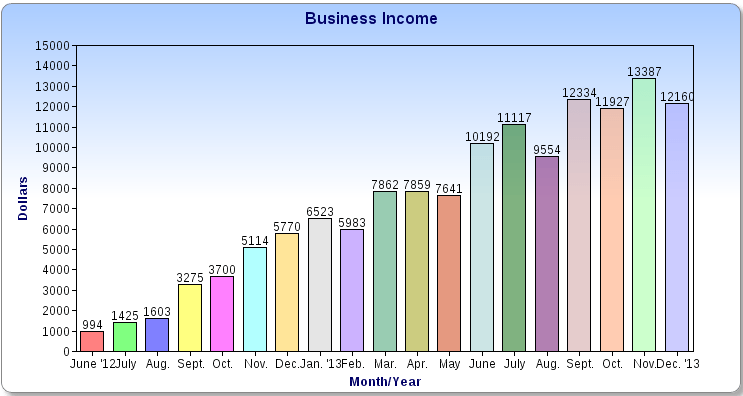 I like how each bar in your Business Income graph has a unique color. Lol, what’s going to happen when you run out of colors eventually? I recently switched my income graph so the bars represent quarters instead of months. Sounds like you were pretty busy as usual last month 🙂 More than doubling your income from last year is amazing. Awesome job! Ha! I’ve been running out of space, so I’ve actually had to cut beginning months out. Wow! You had a great December income! You’re on the very right track, keep it up! Just axing and inspiring, like always! Love love live it! This is sheer awesomeness, but im curious after taxes, fees and etc what was your take home? But I am making this a part of my goal for 2014, as the saying goes if you want to see a change you have to do something different than what you have been doing. This is it. Thank you for sharing your journey! I totally understand, privacy is a must. but thanks for sharing the tax rate. I do taxes on the side with H&R Block part time. When I start to do this, I will at least have the tax portion of how to compute everything down packed. You are a great inspiration! Hi Michelle, what a fantastic report once again! This is a great motivator! – How long did you monitor the website you purchased before deciding to buy it? – Was there a long and complex negotiation process or was it a relatively simple transaction? Right now, I am definitely not an expert when it comes to buying websites, but these are great questions for when I buy in the future. The site I purchased was SUPER cheap and I pretty much just bought it on a whim. The negotiation process was short as well, but that’s because the price was so low. Wow another impressive month of work Michelle! Since I am very new to blogging still, my goal is simply to create good content and create some solid stats. If I’m lucky, maybe I can earn something by the end of the year. I am hoping to make some money by finding offline hustles though! Also, I would love to hear about website buying and flipping. Sounds really interesting! Thank you Liz! I hope 2014 is a great blog year for you. Another awesome month Michelle! I had my best month ever last month, so reading your report is definitely encouraging to me, though I can attest to the hard work needed. 🙂 As you know, I’m interested in buying a site or two and looking forward to reading how you went through buying the one you did. Michelle, I remember when you started ~2 years ago and it’s so amazing to see how far you’ve come! You have a gift and it’s funny that you’re so hard on your self (e.g. “I do need to try working harder”) when you’ve come so far! I’ve heard of people buying websites and always wondered how profitable that could be for the right person. Let us know how it goes! Thank you Camille! And haha yes, at times I am probably a little too hard on myself. You did it once again. Congratulations!! Great numbers! Congrats. Truly an inspiration and proof of hard work paying off. 6 figures in “extra income” for the year 2013 is AH-MAZING Michelle! 🙂 I can’t wait to see you grow your business in 2014! Looking good! That is a very, very respectable income, I am in awe. I’m glad that you’re enjoying the freedom that comes with working for yourself. Here’s to a very successful year of self-employment! Thank you Anne! It has been amazing working for myself. Congratulations on your business income. As always very inspiring. That is an awesome way to end 2013! I’m sure you’ll blow that amount away this year. Thanks for breaking down the individual tasks you do for blog management, it sounds interesting. I think you deserve some “lazy-time” after working so hard for years; plus, you’re still meeting your income goal while enjoying life. Great work! You’re killing it. eBook title: “How to make $10,000+ per month on website-related activities” — just break down those categories in a book, and it will sell! Thank you Kathleen! And that’s a great title 🙂 I might just start that! I second her e-book idea! 🙂 Congrats on all your success in 2013!!! Wow! How inspirational and remarkable!! Good for you! Michelle, That is great, I hope to go full time this year as a blogger too. Awe the man plans the honeymoon….start the marriage off right my letting him plan things. Else he will always ask you what you want to do and that will eventually get on your nerve. he can make it nice, lol. Consistently so impressive! Building up affiliate income is definitely on my “to-do” list for this year, so it building up some more freelancing clients. I agree with other commenter who have suggested selling an e-book describing how you make money online. It’s obviously a topic that a lot of people are interested in. You are such a great motivation for others who wish to get on this path! Another great month! It’ll be great to hear what you do with that website you bought! I get a kick out of you sort of beating yourself up over only making TEN THOUSAND DOLLARS in one month. Dude, don’t kill yourself. You’re still on track to make 120k/year which is what my husband and I make combined! ACK I know I am crazy. I do have to pay taxes on all of it though and pay for health insurance! Hi, Michelle- Wow! You have a lot going on for someone who has “taken some time off.” I find it very encouraging that you didn’t think you could be this successful when you started but with a lot of hard work, here you are. I would be very interested in a post on buying websites because I don’t know what to look for when evaluating a site. Yay Michelle! I love these income posts. Keep them coming! They are so encouraging. 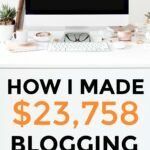 5 Figure income from blogging, that is quite amazing! One thing I was going to ask about was the VA thing, but I see you have a couple of articles about that already so will read those now. One question though, it seems like you are offering your services out as a VA, whilst also hiring VAs to run some of your other websites. What is the thinking behind this? Is this not a little like working as a cleaner, while paying someone else to clean your own house? I’d be interested to know the logic behind that set up, thanks! Well done on your monthly income. The bar tab really puts things in perspective that growing your income is a progress thing and doesn’t happen over night. Looking forward to reading more about your future successes. Michelle always impressive income. To a better 2014 in the income department. As always, I’m so inspired by your income post Michelle! I like the sound of your blog management services, I could have done with this during December as I took a break away from blogging for a while. I’ll definitely think of you if I need to take a break during 2014 at all! Great job, Michelle! You are obviously doing great! I think most people’s traffic and income slows down right around the holidays. It’s hard to get any traction when no one is at work and reading your blog! Michelle, you do such a great job – thank you so much for sharing all of your expertise. If you would be comfy revealing it one day, I’d be glad to know how much you make from AdSense particularly, and if you have any tips on successful AdSense income tips. So glad to hear that self-employment is working for you! Wow, keep up the great work and keep that revenue growing! I think it’s fine to slack off once in a while, especially if you can make over $10K while still taking a few days off! December wasn’t bad, but it definitely wasn’t my best month yet. Hoping for a better January! Wow, I am always impressed. Great job Michelle! Great job! I want to boost affiliate more but have been rejected from a lot of programs for being not US based. Frustrating. I don’t think I ever get tired of these updates. So inspirational – go girl! This is crazy and SO INCREDIBLE!!! Wow!! First of all- great job. You seem like such a hard worker and that it is money very well earned! Best of luck to you in 2014! I look forward to reading about it. I would also second that request for a future article on how you went about buying your first website, specifically what factors did you take into consideration, and your eye on what to look for in realizing that you could greatly improve the (future) website metrics with your own management and content. Additionally any colour that you can provide on the mechanics of the transfer process from seller to buyer would also be helpful! It’s so ridiculously amazing that you are making $10K every month. You inspire me chica! Congratulations, Michelle! I love seeing how well you’re doing!